The Serene Stamper: Homemade Kindness Makes for a Cozy Season! 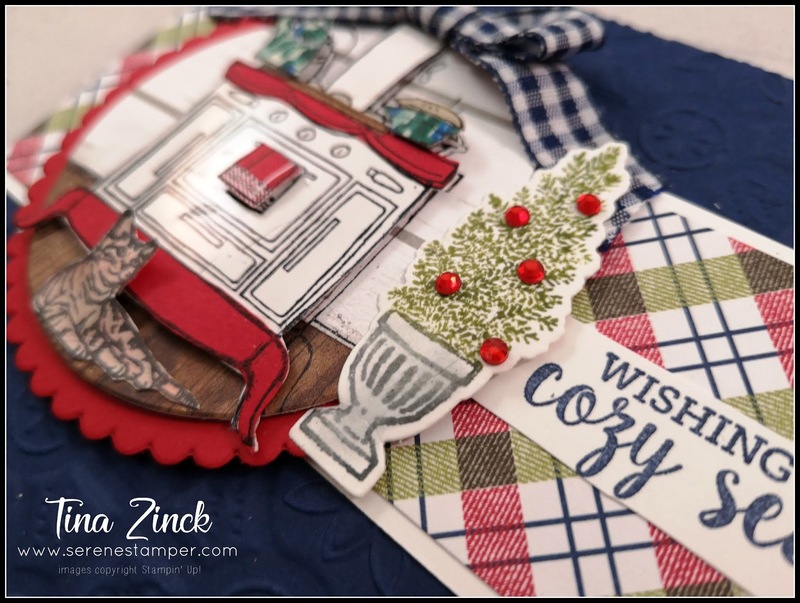 Homemade Kindness Makes for a Cozy Season! Hi Friends! 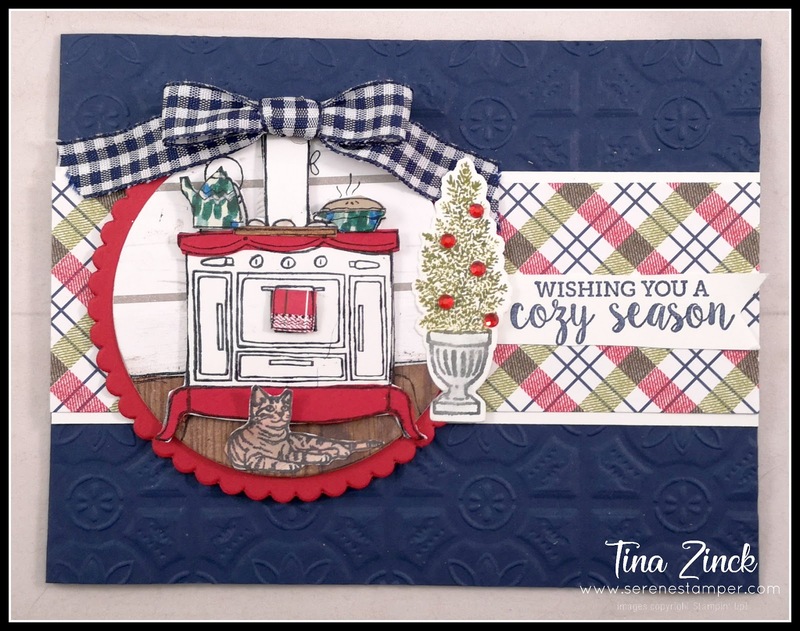 Yesterday I decided to have a play and create a card using the "Homemade Kindness" stamp set. This set is right up my alley, as I loved having my old Enterprise wood cook stove, back when I lived in New Brunswick. During the winter months I'd have a pot of soup simmering on the stove, or potatoes baking in the oven for quick meal. I rarely used the electric oven when the wood stove was going, there was no need! I even baked breads and pies in that old oven and one year I cooked a turkey and all the trimming for Christmas when we had no power due to a bad storm. I did quite a bit of paper piecing on this card, as you can see. The floor was cut from a piece of Wood Textures DSP and the wall is cut from a piece of Festive Farmhouse DSP. I also used scraps for the hanging towel, pie plate and tea kettle (Garden Impressions DSP). The stove was stamped onto Glossy White card stock and I added some Real Red card stock for the legs and trim. 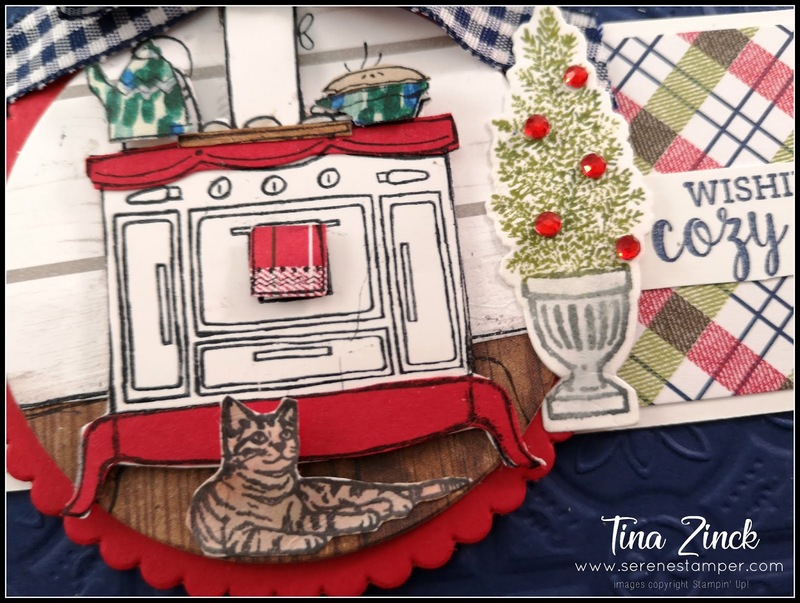 Then it occurred to me that the cat from the "Sitting Here" stamp set might work well on this card - and it did! And true to life, my cat Lewis, as well as my dogs, would all lie on the floor, sound asleep, next to the stove. 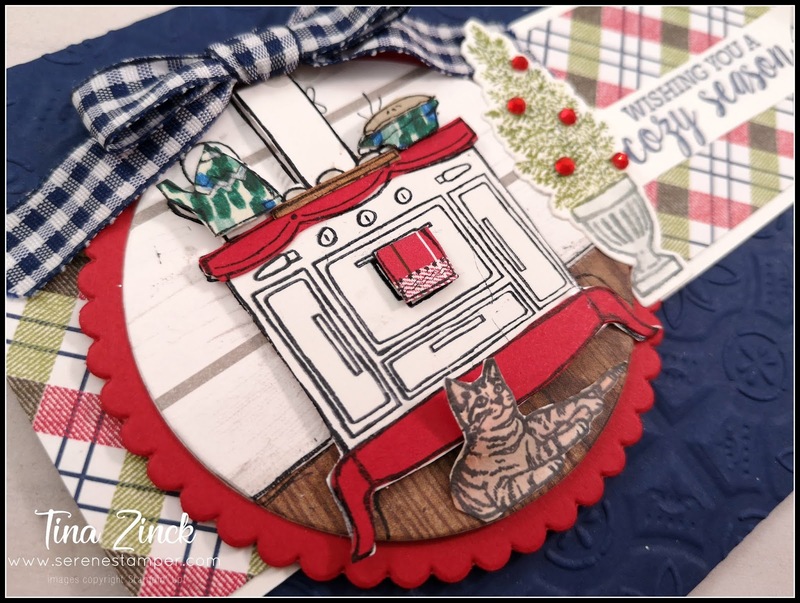 The tree is from the At Home With You set and I decided to add it simply because I had an inky smudge next to the stove that I needed to cover up! The tree worked perfectly - though I'd never put a tree that close to the wood stove when it was fired up LOL But it sure added a nice holiday touch to this Christmas card! I have so many ideas for this "Homemade Kindness" stamp set - recipe pages for my album, boxes and tags for Christmas gifts, etc. If you're like me and love country livin', you'll need to get this set! And guess what? We've got a MASSIVE Black Friday sale that will be SIX days long, starting November 23rd! Three different sales, each lasting 48 hours, with TONS of Stampin' Up! products 10% off! You won't want to miss this - it's going to be the perfect time to stock up on your favourites, get items from your wish list and shop for Christmas gifts for your crafty friends and family! So get ready for it - Friday, November 23rd!